A culmination of ping pong, tennis and badminton, Pickleball is played on a court with a hard paddle and wiffle-like ball. Last week’s demonstration in Margate went well, said Parks and Recreation Director, Mike Jones, and the amenity will be available soon to Margate residents. Margate resident and fleet manager for the City, Bob De Robertis, has been playing in Davie and suggested the City of Margate take a look at offering the sport here. 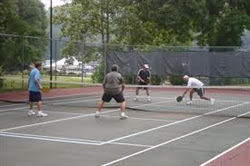 Pickleball is ideal for the over 50 set, he said, and is an exceptional workout for the athletically-inclined so long as players are matched by ability. And because Margate could offer the sport to residents for less than $1,000 investment, De Robertis said it's practical amidst a growing demand for the game. Mitchell Ball is the South Florida Ambassador and his Staff at Pickleball Promotions and South Florida Pickleball brought the Demo/Clinic to Margate.